Year six science resources like these can help turn on a love of science. Check out our materials for teaching year six science, from baking a chemistry cake to keeping a candle burning underwater to a muscle anatomy word search. You can help scientific principles come to life and make learning year six science an adventure. For a review of key scientific concepts, browse our Year five science resources. Learn the basic structure of an atom with this introductory page, complete with a fun experiment they can try at home! Improve your child's knowledge of bones in the human body, with this fun worksheet that focuses on the bones of the arms. Use this lightning diagram to go along with what your child is learning about weather systems in school! How cool are chromosomes? Read what Steve the savvy scientist has to say about chromosomes and genes before testing your knowledge with some fill-in-the-blanks. Kids can practise reading informational texts and explore the periodic table with this introduction to science topics that will extend to high school chemistry and beyond. Ever wonder how the human body functions? Enjoy this great info sheet all about the human heart, one of our most important organs. This skeletal system worksheet, featuring a funny diagram of a human skeleton, is just the thing kids need to master their skeletal system vocabulary. Do you know what DNA is? Steve the savvy scientist has the answers! Join this wacky scientist as he explains the basics behind our DNA and our genes. 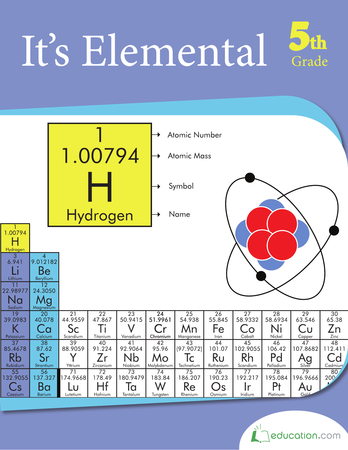 Review the first few elements of the periodic table with these colorful flashcards. Check out this Awesome Anatomy page about your voice. The brain is the most important organ in the human body. Get a basic grasp on the parts and functions of the brain with this anatomy info sheet. After your child fills in this review sheet on chemical and physical properties, it's a good idea to hold onto it for future test review! Awesome Anatomy: If I Only Had a Brain! This Awesome Anatomy sheet focuses on the brain, often considered the most vital of vital organs. Human anatomy may be complicated, but even more intricate is our DNA! Learn the basics of our body's building blocks with an informative sheet. The periodic table of the elements is an important classification system of the most basic particles that make up our world! Use this blank periodic table to work on your memorization of the table for your next quiz! Our understanding of the atom has changed over the past few hundred years! Read about a few different theories on the structure of an atom. Did you know that air has substance too? Learn about air resistance, also known as drag. Air resistance affects the movement of all the things on our planet! Studying the human body? Get to know your body inside and out with this muscle diagram. Ever wonder why sounds change as they move away from us? Learn all about the Doppler effect with this physics worksheet. Help your child understand pollination with this informative worksheet, complete with a diagram. See just how connected the ears, nose and throat are with this anatomy worksheet! Get to know your genes with Steve the savvy scientist! Genes help determine everything from your hair colour to your height. A handy worksheet that breaks down the properties of metal. A good physical science review sheet to keep around for reference.